Most people use a chopping block just to cut the food. But this cutting board for meat is so custom and good-looking that it is a good serving tray for steaks, loins, chicken and even cheese. 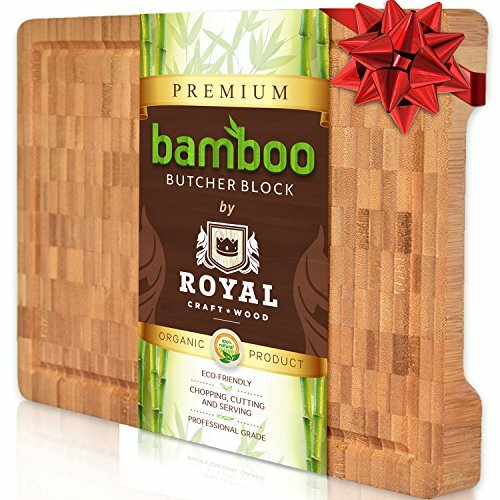 Our customers consider this top rated bamboo cutting board to be a good present. It fits every sort of kitchen and looks very custom. Unlike any birthday card, a wooden chopping block would also be a practical decision, as one of the kitchen must-haves, it will never be forgotten somewhere in the drawer. THICK AND DURABLE. End grain bamboo cutting board is resistant to cuts and scarring, and self-healing over time (the density of the fibers will push back into place). BEST FOR EVERYDAY USAGE AND STORAGE. Optimal size of 13.5"x10" is big enough for cutting and chopping meat, vegetables, salads and even herbs. And small enough to put into a drawer or to leave on a countertop! Juice grooves won't let the liquids to spill and handles make it a very convenient and fancy serving tray. MONEY BACK GUARANTEE. We are positive you'll find this kitchen butcher block convenient and you stay happy with the quality. ANTIBACTERIAL & ANTIMICROBIAL CHOPPING BOARD. Get over anti-sanitary plastic cutting boards filled with chemicals. BPA free bamboo naturally resists bacteria penetration & growth. By choosing bamboo carving board you stay protected. KNIFE-FRIENDLY. Due to unique surface of this butcher block you're given cooking freedom - slice, cut, carve and chop meat in every way you can imagine. Reusable Silicone Smoothie Straws BPA Free - (x6) EXTRA WIDE 20oz, 30oz, Eco Friendly for Safely Drinking Hot & Cold Drinks | Premium Quality | Protect Your Teeth and Reduce Plastic Waste Now!